Arturo Varvelli is a Senior Research Fellow and Co-Head of the MENA Centre at ISPI. 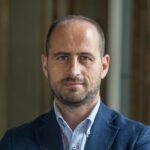 He is also a lecturer of History and Institutions of the Middle East at IULM University in Milan and a visiting fellow at the European Foundation for Democracy (EFD) in Brussels. He works as a scholar on topics such as Italian-Libyan relations, Libyan domestic and foreign politics, Italian foreign policy in the Middle East and Mediterranean region, and jihadist groups in North Africa. Mr Varvelli has served on research projects commissioned by the research office of the Italian Chamber of Representatives and Senate, the Italian Ministry of Foreign Affairs, and the European Parliament and Commission. In 2015, he was chosen by the US State Department to take part in the “International Visitor Leadership Program”.